After spilling some official presentation beans at the end of January, it would appear that the Nvidia GTX 1660 Ti is well underway after a large number of retail boxes have been discovered. Equipped with Nvidia's next-generation Turing GPU, but supposedly has no raytracing support, the current rumor calls for the launch of the GTX 1660 Ti on February 22 (ie, next Friday), a little later than the previous estimate of is Friday, February 15, but still very soon. Is the GTX 1660 Ti the low-end GTX 1060 or, in fact, the successor to the GTX 1050 Ti that we've been waiting for? Here is all we know so far of the latest set of leaking marketing channels. 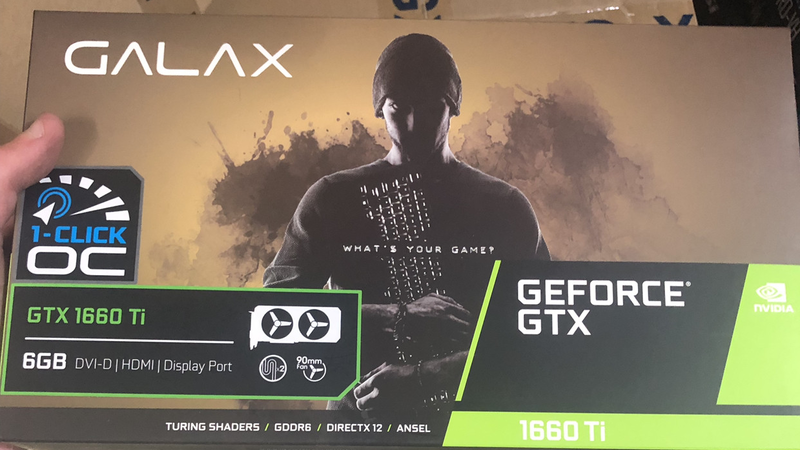 So far, there have been sightings of GTX 1660 Ti boxes from Galax, Palit and EVGA, according to the eagle-eyed people of Hexus and VideoCardz. It would seem that both the Galax box and the Palit confirm that the GTX 1660 Ti will come with 6 GB of GDDR6 memory, while the three make a special mention of having "Turing Shaders" in the small row of additional functions at the bottom. However, the eagle eyes among you will remember that the boxes of Nvidia RTX the graphics card boxes have "RAY TRACING" stuck in this bit where it says "GDDR6, DirectX 12 and Ansel", which would suggest that although the GTX 1660 Ti will have a Turing-based GPU (hence the shaders), its RT or ray tracing The nuclei are very absent. If it's still compatible with other Nvidia RTX features, like DLSS, it's currently unknown, but if I had to guess, I'd probably say no, since Nvidia has now grouped all those features like & # 39; RTX & # 39; in its various RTX On / Off demos and such. I still think that having a GTX 16 series is an immensely confusing move given that we already have a multitude of several cards of the 10 series that cloud the waters of the great division of generational graphic cards, but what can Nvidia do? Global marketing department, huh? Anyway, one last interesting thing to keep in mind is that while the Galax card shown in the image above is a dual-fan card, the Palit and EVGA models only show single-fan coolers. Again, not based on my own speculations, this would make me believe that the GTX 1660 Ti could be more a replacement for the GTX 1050 Ti than a successor to the GTX 1060. Still, if the launch date proposed by Hexus of 22 February must be believed, then we will not have to wait long to find out.